L to R: Democrats State Sen. Dennis Bradley of Bridgeport, Rep. Joe Verrengia of West Hartford and Sen. Cathy Osten of Baltic sat together at the General Assembly's Public Safety and Security meeting on Jan. 15, 2019 at the state Capitol in Hartford, Conn.
L to R: Democrats State Sen. Dennis Bradley of Bridgeport, Rep. Joe Verrengia of West Hartford and Sen. Cathy Osten of Baltic sat together at the General Assembly's Public Safety and Security meeting on Jan.
HARTFORD — In a critical year for gambling in Connecticut, there are three Democrats at the center of a crucial legislative committee who appear poised to clash. State Sen. Dennis Bradley, D-Bridgeport, Sen. Cathy Osten, D-Sprague and Rep. Joe Verrengia, D-West Hartford, are the most powerful voices on the General Assembly’s Public Safety and Security Committee, through which all gambling bills must pass before going to the House or Senate. They represent the diverse perspectives of Democrats on gambling. The party should be able to pass their betting priorities in 2019 — if they can agree. 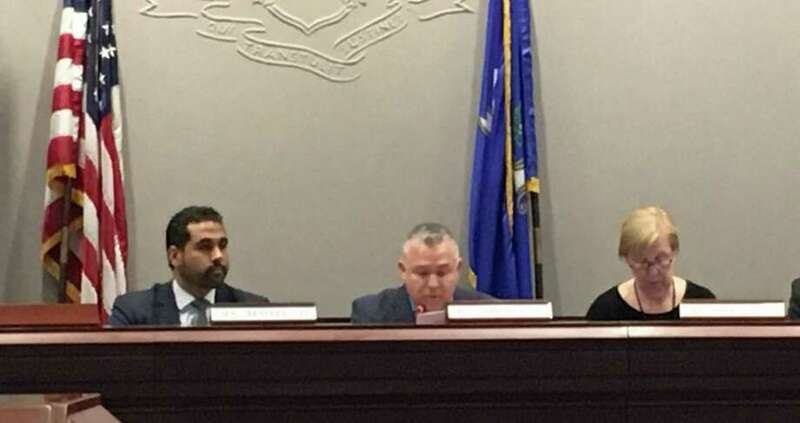 Bradley, Osten and Verrengia sat together on Tuesday in the middle of a horseshoe of lawmakers at the Public Safety and Security Committee’s first organizational meeting. On the left was Bradley, who although he has been a lawmaker for less than a week, is the Senate chair of Public Safety and a voice of Bridgeport’s decades-long effort to get casino. “I’m excited to do some big things,” he said. On the right was Osten, who is not a committee chair, but nonetheless is critical and who favors keeping gaming within the tribes. In the center was House chairman Verrengia who does not fit squarely in either camp. Verrengia supports a proposal that Democrats tried last year: creating a comprehensive gambling policy that would encompass sports gambling, online and off-track betting and casinos. He emphasized his conversations will include all stakeholders. Bradley said he might want to see a separate bill allowing the state to put out a request for proposals for Connecticut’s first commercial casino, although he is still making up his mind. MGM has been lobbying to open a Bridgeport casino for years. A bill for an RFP cleared the House in 2018, but was never called in the Senate. The departure of three Democratic senators from the chamber could give the bill a more favorable outcome in 2019. Before considering any other casinos, Osten wants to sort out delays on the state’s East Windsor casino, a joint venture by the Mohegan and Mashantucket Pequot Tribes, who own Mohegan Sun and Foxwoods respectively. She has also filed her own sports betting bill that would permit Indian casinos to conduct sports wagering in person and online, conduct other types of Internet gambling and allow the Connecticut Lottery Corporation to operate online Keno games. She has not changed her position against a new commercial casino. Both Bradley and Osten insisted that although their views do not align on casinos, they will be able to work together. Verrengia and Osten do not agree on whether federal approval is needed for third casino in East Windsor, a joint venture by the Mohegan and Mashantucket Pequot Tribes, who own Mohegan Sun and Foxwoods respectively. Osten has filed a bill to move ahead without approval from the U.S. Department of the Interior’s Bureau of Indian Affairs. Verrengia has held off on filing gambling bills before meeting with the new staff of Gov. Ned Lamont, including his Legislative Affairs Director, Chris Soto, a former state representative for New London. The U.S. Supreme Court ruled in May 2018 that states are now free to authorize sports betting, which was previously banned everywhere but Nevada. The ruling came after the end of the 2018 legislative session.